November 2014: Recap & Wrap-Up! 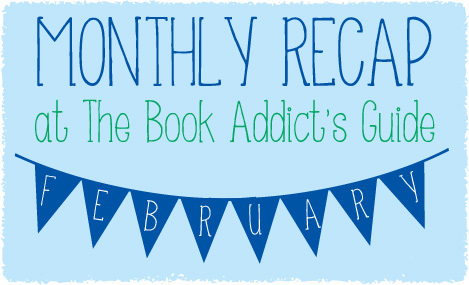 February 2015: Recap & Wrap-Up! February was a pretty decent month! Things have been going well and I’ve been approaching my reading more casually. I’m trying to take on less commitments and picking up whatever I feel like reading (I know I always say that but this time I MEAN it) and I haven’t been reading as many books but the ones I’ve chosen I’ve actually enjoyed much more! I haven’t had too many DNFs or low-rated reads so far this year so I am VERY happy with that! Number of Books Read In February: 7. It was almost only 5 but I finished an audiobook and the copy of LOOP that I borrowed from Andi in the final days of February! Once again, my “Guide” to Crossover books was in the top of my stats! Hooray! This is one of my favorites. Andi and I launched a feature called Have You Seen This…? to help people find editions of books they are looking to collect! We’re so happy it was a bit hit! My recommendations for fans of If I Stay was another big hit this month thanks to search hits! I combined YA books with Disney movies in “YA Meets Disney” and it was SO much fun! I reviewed Midwinterblood by Marcus Sedgwick. We read it together for On the Same Page! All the Bright Places by Jennifer Niven was amazing! And it totally broke me. I finally read Dahlia Adler’s debut, Behind the Scenes! Fairest had me jumping for joy! I always love to fall back into the world of The Lunar Chronicles! On 2/3, I shared my Top Ten fantasy books that I want to read soon! I joined a Valentine’s Day blog hop and shared my “Masters of Swoon“! It was close to Valentine’s Day and about time I made a “Best-Friend-Turned-Boyfriend Romance” part two! We’ve all got our book struggles… Mine were featured on Top Ten Tuesday on 2/17! I participated in the Book Blogger Love-A-Thon and filled out a questionnaire to say hello to everyone! I also shared some snapshots of my favorite bookish photos! I told you the “Flavors of When Joss Met Matt” for the blog tour! I was on the blog tour for The Winner’s Crime and shared my obsession with books, home improvements, and traveling! I went to ALA Midwinter 2015!!! It was SO much fun and a great filler for the conference-shaped hole in my heart since I’m almost definitely not going to BEA this year (oh, time and money). It was at McCormick place in Chicago so that was just PERFECT for me. I actually only went on Saturday and that seemed to be enough… I grabbed all of the books I needed, really! I was going to go back Sunday but we had a crazy blizzard and wasn’t able to go back to the conference OR the Bloomsbury dinner 🙁 🙁 I was super bummed! But Saturday was still a ton of fun. I met up with Katie from Polished Page Turners and we stuck together most of the day. I was SO happy to meet Nicole and Ashley from The Quiet Concert again and to meet Jordin (A Bottomless Book Bag), Kay (It’s A Book Life), and Lisa (Bookish Broads) for the first time!!! I got to meet Brandon Sanderson! The event was NUTS — busier than any regular book event I’ve ever been to — but luckily I was #12 for the signing so I didn’t have to wait forever! (Thank GOODNESS we know how Anderson’s operates!) He was so nice, clever, and funny and he personalized three books (I chose my Mistborns!) and autographed ALL of the rest. It was awesome! WHAT’S IN STORE FOR MARCH? My birthday is on the 11th so I’ll be doing another birthday post and giveaway! Woo! March’s theme for the Book Blogger Organization Challenge is Social Media so be prepared to update & crosspost! I’m on the blog tour for Jessica Brody’s final book in the Unremembered trilogy — UNCHANGED — on March 3rd! I’m having an impromptu Reckoners series weekend… aka, I binge read Steelheart, Mitosis, and Firefight and I’m posting their reviews back to back to back! February 2014: Recap & Wrap-Up! January 2015: Recap & Wrap-Up! November 2014: Recap & Wrap-Up! September 2014: Recap & Wrap-Up! This entry was posted in Books, YA and tagged 2015, Books, February, Monthly Recap, Wrap-Up, YA, Young Adult on March 1, 2015 by Brittany. Snow white and Rose red and Fred, hahaha. It’s great you had such a good time at ALA, I really wish we had events like that over here – or that it would be closer so I could join you guys. Happy March :D! Sounds like you had an amazing month Brittany, and it’s great that you’re making time to just read the books you want to, rather than arcs and such, so keep up the good work! You had a great month. Looking forward to March! February was an awesome month for you! I cannot wait to start The Winner’s Crime 🙂 It was great finally meeting some many bloggers at ALAMW! I just finished All The Bright Places, it was great the ending though… I was not expecting it and it was heart breaking!